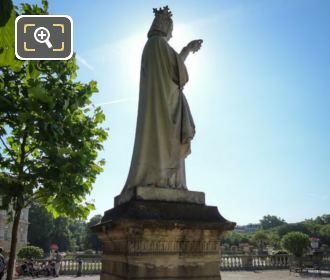 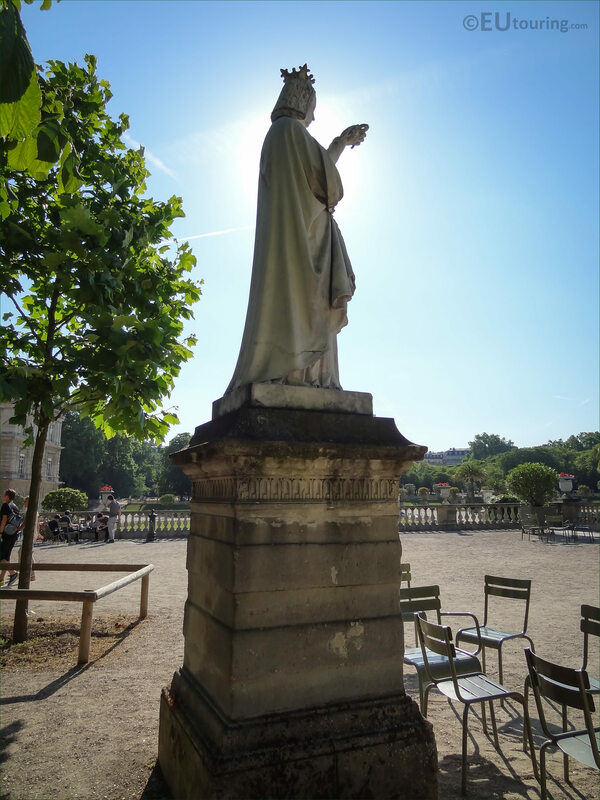 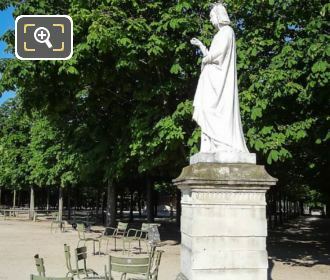 While we were within the Jardin du Luxembourg in the 6th Arrondissement of Paris, this time we took these high definition photos showing the statue of Anne de Bretagne, sculpted by Jean Debay. This first HD photo shows the full marble statue of Anne de Bretagne, which in English translates to Anne of Brittany, and positioned on a stone pedestal, this one was of a series of French queens that was commissioned for the Luxembourg Gardens by King Louis Philippe I. 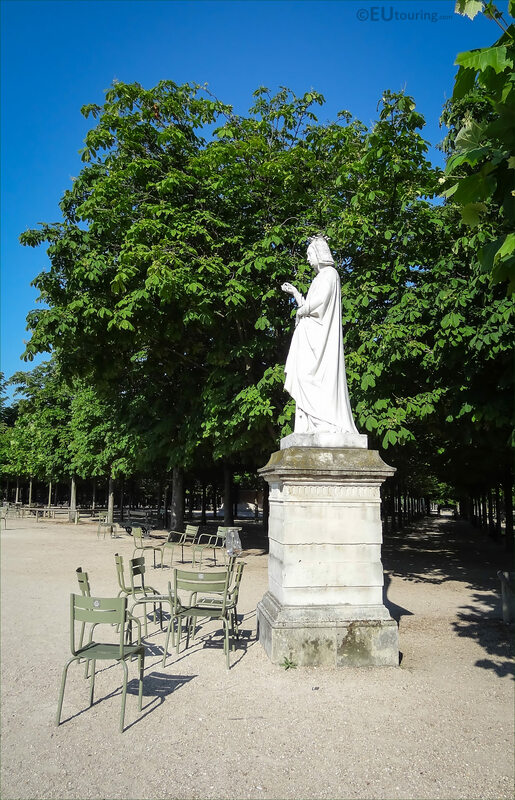 Now this is part of the series of Reines de France et Femmes Illustres, which in English translates to Queens of France and Famous Women, that were sculpted by different artists to go on the terraces that surround the formal garden and large basin, or pool, of the Jardin du Luxembourg, and this particular one was produced by Jean Baptiste Joseph Debay. So, sculpted in marble and standing at a height of 1.95 metres, this statue of Anne of Brittany was commissioned to the artist for the sum of 12,000 French France by a Ministerial Order dated 16th July 1844, and it was completed on 21st August 1846, yet the marble statue was first presented at the 1847 Paris Salon, with an item number of 2071, prior to being placed within the gardens. 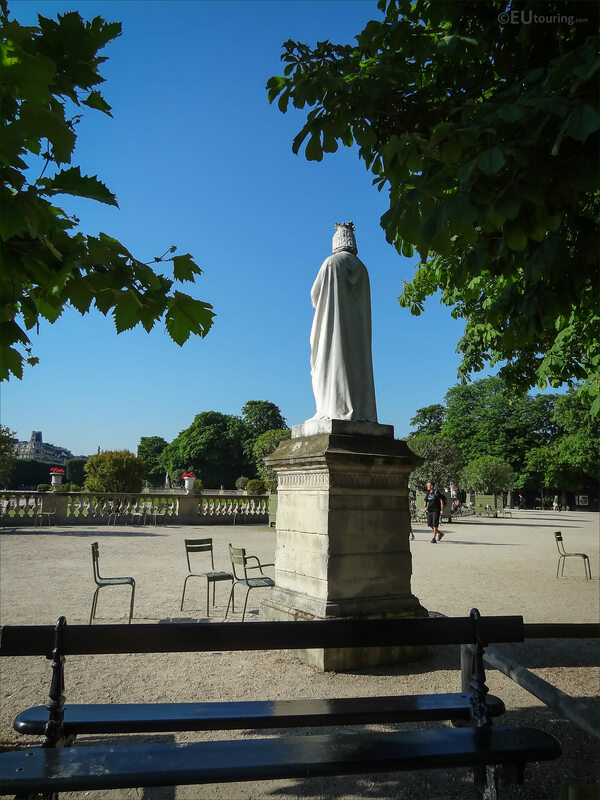 And this photo shows the back of the statue depicting Anne de Bretagne looking over the terrace towards the formal central garden area, and she also became a Reine, or Queen of France through her marriage. 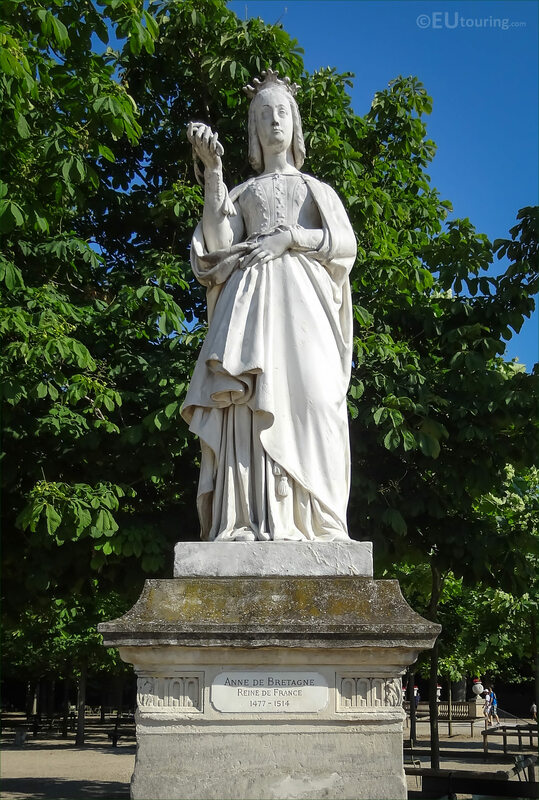 Yet incredibly, she was married on three separate occasions, which was initially to Maximillian I of Austria, but this was annulled so that she could marry King Charles VIII of France and after he died in an accident, through one of the stipulations put in place upon this marriage, she then married King Louis XII. But getting back to the artist himself, as we mentioned earlier, this marble statue was produced by Jean Baptiste Joseph Debay, who is sometimes referred to as the Son Jean Depay, or Debay the younger, as his father had the same name. 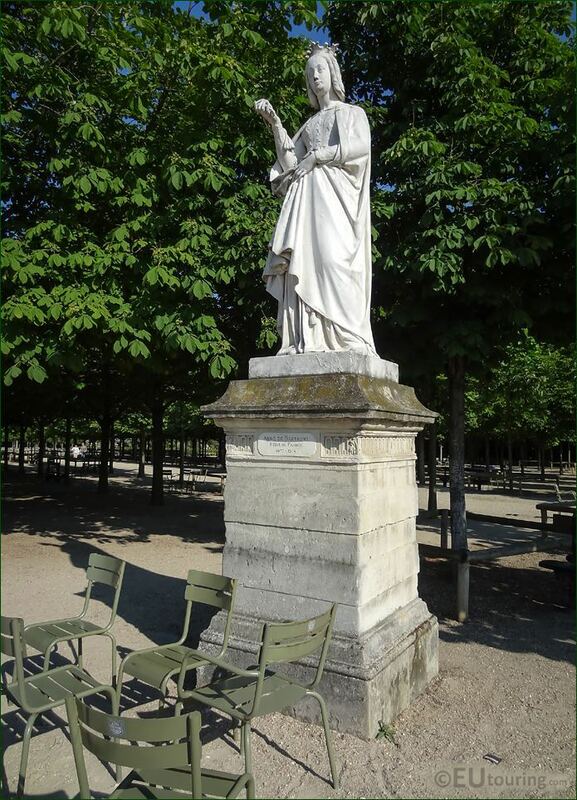 And born in Nantes in August 1802 he studied at the Ecole des Beaux Arts in Paris, becoming a French sculptor and won the Prix de Rome in 1829, which meant that after returning to France from additional studies in Italy, he was awarded several different commissions prior to passing away in 1862. 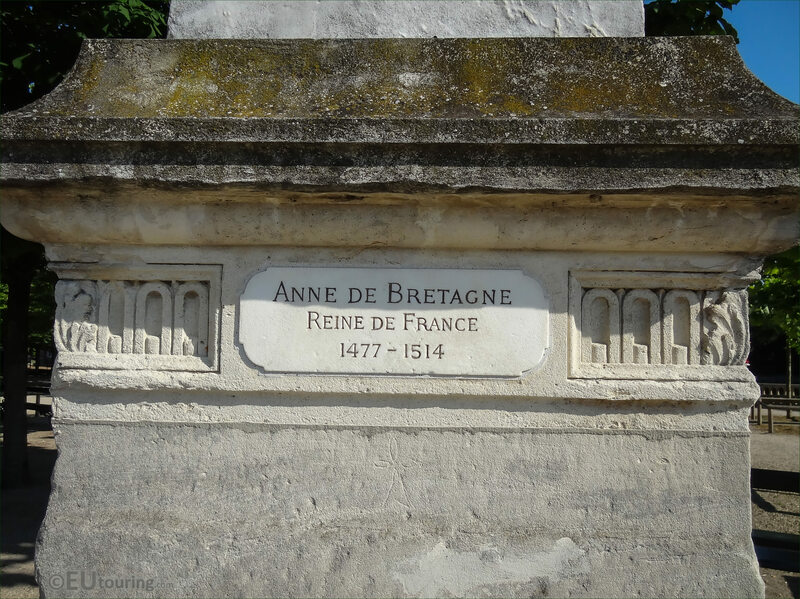 Yet this last image shows a close up of the plaque located at the top part of the stone base of the statue, and as you can see, along with the name of Anne de Bretagne, underneath it states Reine de France and then the year of her birth being 1477. 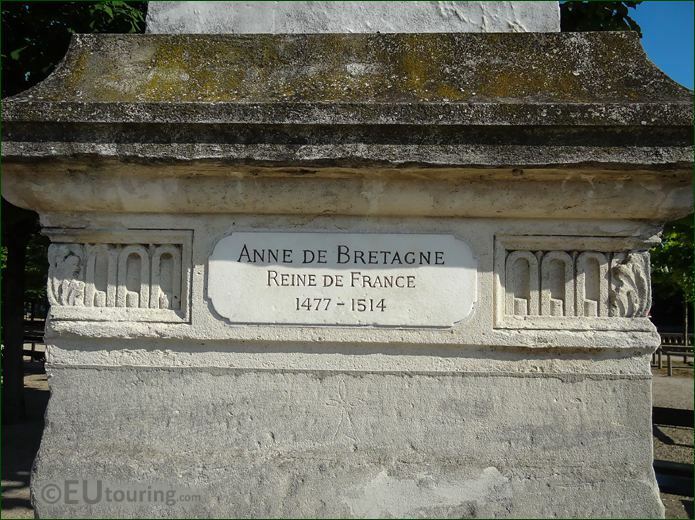 However, it also states the year of her death as 1514 making her only 36 when she died, and according to historical records, she was absolutely exhausted from the numerous pregnancies and births that she had, totalling at least fourteen, although there were only two children who survived.